The Missouri Botanical Garden announces the publication of horticulturist Cindy Gilberg’s writings to educate gardeners about using native plants to conserve land, attract wildlife and regenerate ecosystems. The book, entitled, “Gardening is a Verb: Cultivating Spaces That Nourish Heart and Soul, Essays on Native Landscaping,” will be released in late February 2015. The project shares Gilberg’s broad knowledge of ecologically-based landscaping and strives to inspire both long-standing as well as new audiences and features a broad selection of her native plant articles illustrated with full-color photographs and examples of her landscape design drawings. 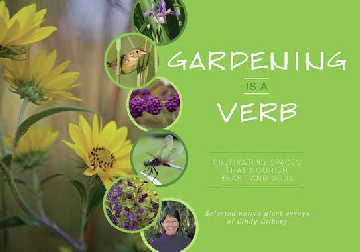 “Gardening is a Verb” is available at Hillermann Nursery & Florist, the Missouri Botanical Garden’s Garden Gate Shop, the Butterfly House and Shaw Nature Reserve as well as other partnering organizations in St. Louis and across Missouri. The soft bound, full color book retails for $12. The book includes a list of over 150 native plants noted in the essays, including Shaw Nature Reserve’s “Top Performing Natives.” Plants noted for all types of light and soil conditions include grasses and sedges, flowering perennials and annuals, vines, shrubs and trees. A full-color table spotlights popular characteristics such as attractiveness to birds and butterflies, use in rain gardens, deer resistance and winter interest; and notes bloom time and both flower and fall colors. Sale proceeds will benefit native plant research, conservation, and education efforts at Shaw Nature Reserve, where Gilberg worked, taught and cultivated exceptional native plant landscape designs. St. Louis native Cindy Gilberg, who passed away last summer, was an expert horticulturist who taught numerous gardeners how to create beautiful landscapes that have served to benefit the environment by using our region’s native plants. In addition to operating the successful Gilberg Perennial Farms, a destination for novice and seasoned gardeners alike, Cindy taught horticulture classes at the Missouri Botanical Garden, Shaw Nature Reserve and many other locations throughout the region for both the residential and commercial gardening community for 30 years. She was also a talented writer, contributing a wealth of articles to publications statewide. The collection of writings share her personal reflections along with the practice of using native plants to conserve water, support biodiversity, building healthy soils and reducing the use of chemicals.